There are two memorials. One in the shape of a cross bears 40 names with initials from the First World War and is located near to the church on the village side of the A5, to be found by Wirral and Dove Cottages at the end of the High Street, Markyate. 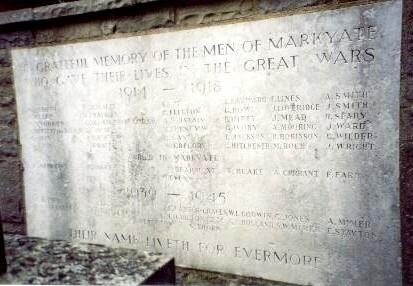 The other is a stone plaque in a wall behind the memorial which also includes men from the Second World War. Full names are given. There are some spelling differences between the two, and three men are on the plaque but not on the cross. There are also two small plaques commemorating men from Markyate who have died in conflicts since 1945. Serjeant 104336. 1st Garrison Battalion, Sherwood Foresters (Notts and Derby Regiment.) Formerly 4784 Yorkshire Regiment. Died Monday 1 July 1918. Age 25. Son of Francis Edward and Annie Abbott, of Markyate; husband of Adelaide Abbott, of 78, Main Road, Glascote, Tamworth, Staffs. Born Markyate. Enlisted Bedford. Buried: CAIRO WAR MEMORIAL CEMETERY, Egypt. Ref. O. 202. Private 22445. 5th Battalion, Royal Irish Fusiliers. Died Saturday 25 October 1919. Age 33. Son of William and Annie Andrews, of Markyate; husband of M. E. Andrews, of High St., Markyate. Buried: MARKYATE (ST. JOHN THE BAPTIST) NEW CHURCHYARD, Hertfordshire, United Kingdom. Ref. B. 266. Gunner 101455. 199th Siege Battery, Royal Garrison Artillery. Died Thursday 19 June 1919. Age 31. Son of Walter and Eliza Ayres, of Poole, Dorset; husband of Minnie Hucklesby (formerly Ayres), of Aley Green, Luton. Buried: MARKYATE (ST. JOHN THE BAPTIST) NEW CHURCHYARD, Hertfordshire, United Kingdom. Ref. B. 262. Probably: Bombardier 28772. 104th Company, Royal Garrison Artillery. Died Wednesday 13 September 1916. Born Markyate. Lived Dunstable. Enlisted Luton. Buried: BAGHDAD (NORTH GATE) WAR CEMETERY, Iraq. Ref. XXI. P. 16. Serjeant TR/9/8002. 27th Training Reserve Battalion, Bedfordshire Regiment. (53rd Btn on CD). Formerly 13391 Bedfordshire Regiment. Died at home Tuesday 12 December 1916. Born, lived and enlisted Luton. Buried: MARKYATE (ST. JOHN THE BAPTIST) NEW CHURCHYARD, Hertfordshire, United Kingdom. Ref. B. 228. Driver 524370. 487th Field Company, Royal Engineers. Died Sunday 16 September 1917. Husband of M. J. Davies (formerly Blake), of 2, Council Houses, Caddington, Luton. Born Markyate. Enlisted Luton. Buried: MARKYATE (ST. JOHN THE BAPTIST) NEW CHURCHYARD, Hertfordshire, United Kingdom. Ref. B. 240. Lance Corporal 43465. 11th Battalion, Suffolk Regiment. Died of wounds Tuesday 10 April 1917. Age 20. 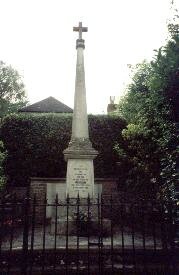 Son of Harry and Eliza Cain, of 128, High St., Markyate, Dunstable, Bedfordshire Born Flamstead. Enlisted Luton. Served 2 years and 10 months. Buried: AUBIGNY COMMUNAL CEMETERY EXTENSION, Pas de Calais, France. Ref. I. L. 67. Lieutenant Colonel. 4th Battalion, Bedfordshire Regiment. Died Wednesday 27 March 1918. Age 38. Son of Arthur and Caroline Mary Collings-Wells, of Brand's House, Hughenden, High Wycombe, Bucks. Buried: BOUZINCOURT RIDGE CEMETERY, ALBERT, Somme, France. Ref, III. E. 12. Citation: An extract from The London Gazette, dated 23rd April, 1918, records the following:-"For most conspicuous bravery, skilful leading and handling of his battalion in very critical situations during a withdrawal. When the rearguard was almost surrounded and in great danger of being captured, Lieutenant Colonel Collings-Wells, realising the situation, called for volunteers to remain behind and hold up the enemy whilst the remainder of the rearguard withdrew, and with his small body of volunteers held them up for one and half hours until they had expended every round of ammunition. During this time he moved freely amongst his men guiding and encouraging them, and by his great courage undoubtedly saved the situation. On a subsequent occasion, when his battalion was ordered to carry out a counter-attack, he showed the greatest bravery. Knowing that his men were extremely tired after six days' fighting, he placed himself in front and led the attack, and even when twice wounded refused to leave them but continued to lead and encourage his men until he was killed at the moment of gaining their objective. The successful results of the operations were, without doubt, due to the undaunted courage exhibited by this officer. Private 3/8499. (3/8490 on CD) 8th Battalion, Bedfordshire Regiment. Died of wounds Thursday 20 April 1916. Born Flamstead. Lived Markyate. Enlisted St. Albans. Buried: LIJSSENTHOEK MILITARY CEMETERY, Poperinge, West-Vlaanderen, Belgium. Ref. VI. C. 17A. (CURRUNT on cross) Private 5458 Bedfordshire Regiment. transf. 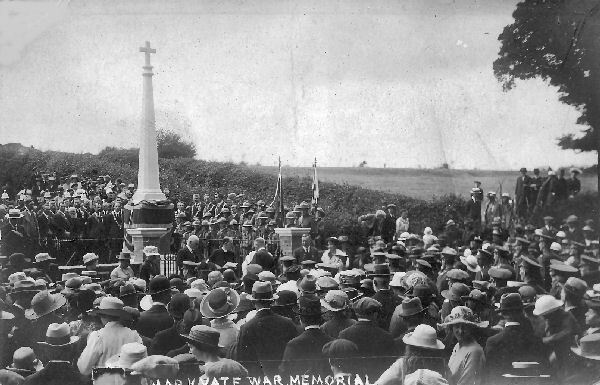 to (240033) 433rd Agricultural Coy, Labour Corps. Died at home Friday 16 November 1917. Age 45. Son of the late Samuel Currant, of Markyate; husband of the late Jane Currant. Lived Markyate. Enlisted Bedford. Buried: MARKYATE (ST. JOHN THE BAPTIST) NEW CHURCHYARD, Hertfordshire, United Kingdom. Ref. B. 241. (DAVIS on plaque) No further information available at present. Private 8780. 2nd Battalion, Highland Light Infantry. Killed in action Monday 17 April 1916. Born and enlisted Luton. Lived Markyate. Buried: TRANCHEE DE MECKNES CEMETERY, AIX-NOULETTE, Pas de Calais, France. Ref. A. 10. Probably Leslie Howard Gant. Private 25901. 7th Battalion, The Queen's (Royal West Surrey Regiment.) Formerly 38159 Royal Warwicks Regiment. Died Friday 23 August 1918. Born Pimlico, Middx. Lived and enlisted Luton. Buried: BECOURT MILITARY CEMETERY, BECORDEL-BECOURT, Somme, France. Ref. II. A. 5. Private 203126. 1st/5th Bn, Bedfordshire Regiment. Died Saturday 9 November 1918. Born and lived Markyate. Enlisted Bedford. Buried: CAIRO WAR MEMORIAL CEMETERY, Egypt. Ref. Q. 84. Possibly: George Hayward. Private 3/8776, B Company 1st Battalion, Bedfordshire Regiment. Died of wounds Wednesday 12 May 1915. Age 40. Son of Mrs. A. Hayward, of 59, London Road, Markyate, Dunstable. Born Luton. Lived Markyate. Enlisted Luton. Buried: LE TOUQUET-PARIS PLAGE COMMUNAL CEMETERY, Pas de Calais, France. Ref. I. B. 32. Private 27567. 2nd Battalion, Bedfordshire Regiment. Killed in action Sunday 9 September 1917. Born and lived Markyate. Enlisted Bedford. Buried: OOSTTAVERNE WOOD CEMETERY, Heuvelland, West-Vlaanderen, Belgium. Ref. II. D. 5. Private 9485. 1st Battalion, Bedfordshire Regiment. Killed in action Saturday 12 June 1915. Born Flamstead. Lived and enlisted Luton. Buried: LARCH WOOD (RAILWAY CUTTING) CEMETERY, Ieper, West-Vlaanderen, Belgium. Ref. I. D. 15. Lance Corporal 17911. 6th Battalion, Bedfordshire Regiment. Killed in action Wednesday 10 November 1915. Son of Mrs. E. Kitchener, of Valley Lane, Beechwood, Dunstable. Born Richmond, Surrey. Lived Dunstable. Enlisted Luton. Buried: BIENVILLERS MILITARY CEMETERY, Pas de Calais, France. Ref. IV. A. 3. No further information available at present. Private 51626. 1st Battalion, Lincolnshire Regiment. Formerly 23165 Bedfordshire Regiment. Died Sunday 13 October 1918. Age 35. Husband of Emily Mead, of 1, Luton Road, Markyate, near Dunstable. Born Markyate. Enlisted Luton. Buried: TERLINCTHUN BRITISH CEMETERY, WIMILLE, Pas de Calais, France. Ref. XVI. E. 11. Private 7278. 3rd Battalion, Coldstream Guards. Died of wounds Saturday 9 October 1915. Age 27. Son of Mrs. S. Mooring, of 65, High St., Markyate, Dunstable. Born and lived Markyate. Enlisted London. Buried: LILLERS COMMUNAL CEMETERY, Pas de Calais, France. Ref. IV. C. 21. Private 203454. 1st/5th Battalion, Bedfordshire Regiment. Formerly 524395 R.E. Died of wounds Saturday 3 November 1917. Age 21. Son of Frank and Agnes Elizabeth Spary, of 2, Pickford Road, Markyate, Dunstable. Lived Markyate. Enlisted Luton. Buried: DEIR EL BELAH WAR CEMETERY, Israel. Ref. D. 95. Private 54559. 3rd Reserve Battalion, Machine Gun Corps (Infantry). Formerly 80520 R.A.M.C. Died at home Sunday 10 November 1918. Age 25. Son of Charles and Louisa Stevens, of 9, Cleveland Road, Markyate. Lived Markyate. Enlisted Bedford. Buried: MARKYATE (ST. JOHN THE BAPTIST) NEW CHURCHYARD, Hertfordshire, United Kingdom. Ref. B. 252. Private 6871. 1st Battalion, Bedfordshire Regiment. Killed in action Wednesday 4 November 1914. Age 32. Son of Ellen and the late William Ward, of Berkhampstead, Herts. ; husband of Edith Mary Ward, of "Sunnyside, Buckland Common, Tring, Herts. Born Great Berkhampstead. Lived Markyate. Enlisted Berkhampstead. Buried: BROWN'S ROAD MILITARY CEMETERY, FESTUBERT, Pas de Calais, France. Ref. VIII. H. 15. Private G/42238. 11th Battalion, Duke of Cambridge’s Own Middlesex Regiment. Died of wounds Sunday 25 November 1917. Born and lived Markyate. Enlisted Bedford. Buried: ROCQUIGNY-EQUANCOURT ROAD BRITISH CEMETERY, MANANCOURT, Somme, France. Ref. II. E. 16. Probably: ALBERT GEORGE BANDY. Private 5956225. 1st Battalion, Northamptonshire Regiment. Died Wednesday 14 June 1944. Age 24. Commemorated: RANGOON MEMORIAL, Myanmar. Face 15. Gunner 1605611. 225 Battery, 74 Lt. A.A. Regiment., Royal Artillery. Died Wednesday 8 December 1943. Age 29. Son of Percy and Mary A. Carpenter, of Markyate, Hertfordshire; husband of Doris A. Carpenter, of Markyate. Buried: BARI WAR CEMETERY, Italy. Ref. II. A. 26. (Surname GRAVES on CWGC) Yeoman of Signals. P/JX 131904. H.M.S. Fleur de Lys, Royal Navy. Died Tuesday 14 October 1941. Age 29. Husband of May Graves, of Markyate, Hertfordshire. Commemorated: PORTSMOUTH NAVAL MEMORIAL, Hampshire, United Kingdom. Panel 52, Column 1. Special Note: HMS Fleur de Lys was sunk by U Boat “U-206” off the Strait of Gibraltar on 14 October 1941. Sergeant 1048381. Flt. Engr. 90 Sqdn., Royal Air Force Volunteer Reserve. Died Saturday 31 July 1943 Age 22. Son of William H. Clifton and Louie Clifton, of Markyate, Hertfordshire. Buried: RHEINBERG WAR CEMETERY, Kamp Lintfort, Nordrhein-Westfal, Germany. Ref. 3. D. 25. Motor Mechanic C/MX 68304. H.M.M.L. 171, Royal Navy. Died Wednesday 19 March 1941. Son of Charles and Jane Holland; husband of Lilian Rose Holland, of Markyate, Hertfordshire. Buried: HASLAR ROYAL NAVAL CEMETERY, Hampshire, United Kingdom. Ref. E. 59. 10. Private D/38569. 2/7th (H.D.) Battalion, Bedfordshire and Hertfordshire Regiment. Died Friday 1 November 1940. Age 36. Son of William and Emily Mimer, of Markyate. Buried: MARKYATE (ST. JOHN THE BAPTIST) NEW CHURCHYARD, Hertfordshire, United Kingdom. Ref. Block C. Row 14. Grave 522. Probably Private 5951453. 5th Battalion, Suffolk Regiment. Died Saturday 30 October 1943. Age 30. Commemorated: THANBYUZAYAT WAR CEMETERY, Myanmar. Ref. B6.S.5. Private 5951223. 1st Battalion The Hertfordshire Regiment., Bedfordshire and Hertfordshire Regiment. Died Saturday 16 September 1944. Age 25. Son of Edward Stayton, and of Florence Stayton, of Markyate, Hertfordshire. Buried: DELHI WAR CEMETERY, India. Ref. 4. D. 2. Gunner 1126453. 70 Field Regiment., Royal Artillery. Died Wednesday 3 March 1943. Age 21. Son of Percy and Eliza Thorn, of Markyate, Hertfordshire. Buried: TABARKA RAS RAJEL WAR CEMETERY, Tunisia. Ref. 2. A. 2.